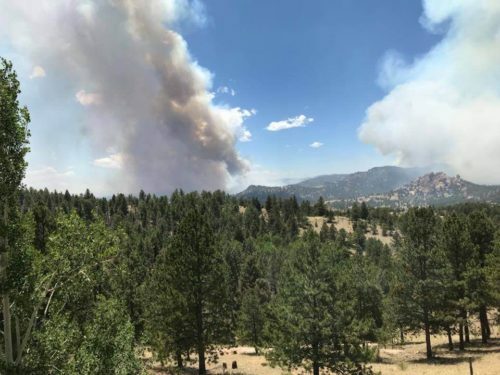 A Fire and A Witness | "Northern Crossings"
This is a forest fire approximately 5 miles SW of our ranch. The fire is officially called the High Chateau Fire. It’s consumed 1400+ acres and, at noon today, is o% contained. We received a mandatory evacuation order at 8 p.m. Saturday. We are safe, in town with friends. Praying for all those fighting the fire and all those in the fire’s path. Lord have mercy! I trust He will never leave us or forsake us! This is from the LWML’s Vice President of Organizational Resources , our old friend from North Dakota that moved to Colorado, Debbie Larson. I used to live in Colorado and moved back home to North Dakota. If I have my geography correct, I used to pick Pinion Pine nuts around this spot. Our prayers are with her and her family and friends. She organized her resources so that she could witness to Jesus in the midst of a scary situation. St. Marks, Benson MN – Project 24 and the LWR quilt Project thanks you. Those Easter Epistles – What is Wrong With Tolerance? It is Thursday afternoon, July 5, and Scott and I are back on the ranch. We are on high alert (still pre-evac status) but we were blessed with 3/4 inch of rain last night and believe we are not at risk at this time. However, we’ve received word that 7 homes, along with other structures, were lost and they are still not allowed back in the two large subdivisions across the highway from us. God is good all the time, even as our earthly possessions may be destroyed. There are no certainties in this life, except our certainty in a Lord that loves us and is with us every step of the way. Today, as every day, I thank my Lord and Savior for the faith He has given me and I pray I will always find peace in the comfort that can only come from Him. I also am so blessed to share Jesus’ message with those around me. This is not a gift to keep to one’s self!